The newer Saint-Chamond, which features the excellent Quick Fire 75mm gun, was design separately from the Schneider CA.1 and features longer tracks and more machine-guns. 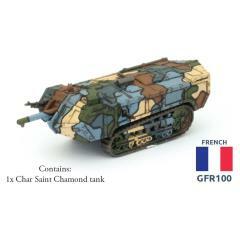 From 1917 to 1918 the Char Saint-Chamond participated in 375 different actions, and at the end of the war only 72 of the original 400 were still left in service. Despite design flaws, the French heavy tanks gave good support to the Poilu on the attack.